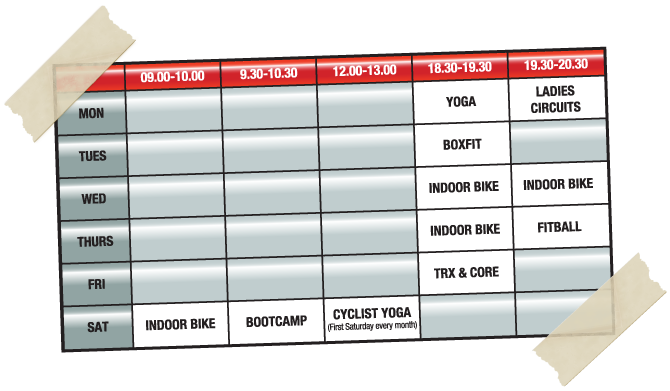 Come and join in with a friendly class sessions led by one of our expert fitness trainers. There's no contract or long term commitment, just book, turn up and get fit. Our class sizes are always kept small so that each person gets the personal attention they need; there's no hiding away at the back at LSPT! All classes MUST be pre-booked! Burn up to 800 cals in an hour in this intense workout. Mind and body class concentrating on posture, flexibility, breathing and relaxation. High intensity workout using different exercise stations...just for the girls. All over body conditioning class using a gym ball. Best in-class workout system that leverages gravity and your bodyweight to perform hundreds of exercises. By utilising your own bodyweight, the TRX Suspension Trainer provides a fast effective total-body workout. Just to add a bit more there's specific core work to finish. Outside battling with the elements as well as the workout. If you want some fresh air while you're training this is the class for you! Please notify Clare ASAP if you are unable to attend a class as we will be running a reserve list system.